“Penguin!” Hadyn shouts at every black and white bird on the horizon. 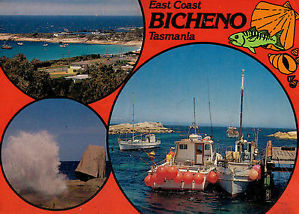 Knowingly, he mistakes large gulls for the little local inhabitants that nest along Bicheno’s rocky shoreline. Someone has unscientifically (and rather boringly) named them Little Penguins; they are the tourist attraction for this, also little, East Coast town. Fuzzy black wings wave at you from souvenir magnets, or drive old Volkswagen vans on cartoon postcards. In the midst of the region’s ‘Busy Season,’ we see more of these battered, vintage vehicles – and the typecast wild-haired, wild-pant-ed people who drive them – than we do penguins. But with two main streets, one post office and one general store, it only takes two VWs to make the place feel crowded.